COMPOSITION: The Armorial Bearings comprise Shield, Crest with helmet and mantling, Badge and Motto. DESCRIPTION: The Shield is based in the arms of the Dolman family, founders of Pocklington School, which displays them. The blue background, gold ‘fess dancetty’ (central zig-zag bar) and two of the eight gold wheatsheaves are features in the new design. The fess is also a feature of, in fact the only bearing in, the shield of the Vavasour family. The wheatsheaves and a water-lily recalling the famous lily-ponds at Burnby hall indicate Pocklington as an important agricultural and horticultural centre, and the activities of the floral and agricultural societies in Pocklington. As well as being an important agricultural centre, Pocklington has played an ecclesiastical role in the life of the district, its Church being known as ‘The Cathedral of the Wolds’, having notable historic connexions with Paulinus and the Archbishopric of York. This is symbolized in the base of the shield by a gold ‘celestial’ or starry crown, emblem of the Saints, in reference to the dedication to All Saints, encircling a plain cross rising from the point of the shield. This refers to the cruciform shape of the Church, and to the early advent of Christianity in Pocklington attested by the cross at the west end of the Church commemorating the preaching of Paulinus on this site in the seventeenth century. The Shield thus represents Pocklington as a notable agricultural, scholastic and ecclesiastical settlement. The Crest is placed on the usual helmet with its crest-wreath and decorative ‘mantling’ or tournament cloak in the colours of the shield, blue and gold, the liveries of the Dolmans, the Percys, former Lords of the Manor, and the former East Riding C.C. At the base is a garland showing three white roses of York, encircling a mural (walled) crown, a familiar emblem in local government, representing ‘a town in Yorkshire’. Out of the crown rises the black eagle of William Wilberforce, one of Pocklington’s most famous scholars, holding in his red beak a length of broken black chain symbolizing his role in the emancipation of the slaves. (The eagle is also a reference to the former East Riding and to the former war-time airfield.) The chain is disposed in the form of a letter W for Wilberforce. The Heraldic Badge or Device is a separate emblem, usually based on the Arms , and has several uses for which the Arms in toto may not be suitable. One of its most important functions is as a ‘community emblem’ which may be displayed by local organizations instead of the Coat of Arms itself, which is exclusive to the Council. The Pocklington Badge combines the historically important wheatsheaf and crown from the Shield within the garland of three white roses of York from the crest, arranged in the shield form. The Motto is ‘Service with freedom’. This not only reminds us of Wilberforce’s efforts to enable slaves to be freed so as to be able to work their living in the community achieved through democratic government. Arms: Azure a fess dancetty of three points or between in chief a crimson water-lily flower leaved proper between two grabs and issuant in base a long cross enfiling a celestial crown gold. Crest: Upon a helm with a wreath or and azure, within a mural crown or masoned sable environed of a garland of roses argent, barbed, seeded and leaved proper, three being manifest, a demi eagle displayed sable holding in the break gules a length of chain in the form of a letter W, the terminal links fracted sable. Badge: Within a continuous rose stem orlewise leaved proper set with three roses two in chief and one in base argent, barbed and seeded proper, a celestial crown enfiled by a garb throughout or. 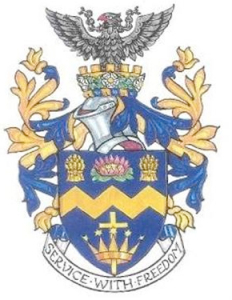 The Amorial Bearings were designed by H. Ellis Tomlinson, M.A., Fellow of the Heraldry Society, Heraldic Adviser to the Rural District Councils Association (1954-74), Heraldic Advisor to the Association of District Councils, designer of the Arms of Pocklington R.D.C, Driffield U.D.C, East Riding C.C.